The Sandyford Hotel offers high quality, cheap hotel accommodation near the SECC, from our very convenient location close to both the West End and City Centre of Glasgow. 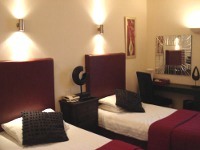 All our hotel rooms are en-suite and come with a cooked full Scottish breakfast as standard. Free Wi-Fi internet access and computers are provided for guest use. Searching for Cheap Hotels in Glasgow? From our online reviews The Sandyford Hotel is generally recognised as one of the best cheap hotels in Glasgow, and we pride ourselves on offering great value bed and breakfast accommodation with a personal touch - lovely clean modern rooms, excellent hotel amenities and a superbly convenient location in the West End of Glasgow's famous Sauchiehall Street, close to Bath Street, Buchanan Street and Argyle Street. And although The Sandyford Hotel is one of the highest quality independent hotels in the city, we offer considerably lower rates than many who advertise themselves as cheap Glasgow hotels. Our friendly and popular hotel is within easy walking distance of a variety of tourist attractions across the City Centre and West End. We are one of the hotels closest to the Scottish Exibition and Convention Centre (SECC), which regularly attracts music-lovers from across the country. From our ideal location you can explore all the delights Glasgow has to offer, including George Square, Charles Rennie Macintosh's School of Art, the IMAX and Glasgow Science Centre, Kelvingrove Art Galleries, Kings Theatre, Royal Concert Hall and much, much more. Because of our central location, the Sandyford Hotel is extremely popular for people looking for hotels in Glasgow near to the city's main shopping districts - including Princes Square, Buchanan Galleries and the Italian Centre to name a few. Food-lovers will find a huge range of restaurants and cafes to suit all tastes and budgets right on our doorstep. And those wanting to explore Glasgow's city centre nightlife will find a host of bars and nightclubs just minutes from the hotel. The Sandyford Hotel is near a wide range of public transport options, including Glasgow City Buses, Taxis, Glasgow Central Train Station, Queen Street Train Station, the Glasgow Underground network, Buchanan Bus Station and Glasgow International Airport to name a few. The Glasgow City Bus Tour also stops right in front of the hotel. The Sandyford Hotel is owned and operated by a family who have been providing affordable accommodation in Glasgow City Centre for many years. Our hotel offers traditional Scottish hospitality including our famous cooked Scottish Breakfast. The accommodation in the hotel was recently fully refurbished and boasts 55 individually-styled hotel rooms all with en-suite bathrooms, direct dial telephone, complimentary tea and coffee making facilities and a 24 hour reception. We provide free wireless internet (Wi-Fi) access for all of our business and private guests. We also provide computers in the reception area with free broadband internet access. Both of these services are available 24 hours a day. Bed and Breakfast choices include: Bacon, Sausage, Smoked Haddock, Kippers, Haggis, Blackpudding, Eggs, Mushrooms, Tomatoes, Fruit Pudding, Potato Scones, Croissants, Pain Au Chocolat, Yogurt, Rolls, Toast, Cereals, Chilled Fruits, Orange Juice, Apple Juice and Grapefruit Juice. We look forward to welcoming you to Glasgow soon!